WHERE DOES THE time go? I often ask myself that very question. Usually without reply. Or indeed much modelling taking place. However last year's AGM certainly provided some much needed inspiration and for the first time in a couple of years I really got back into doing some modelling. I've been mostly concentrating on locomotive construction to build up a stock of decent motive power. I have a couple of completed locomotives which were used extensively on Masham - the J94 on scratchbuilt chassis and the Class 20, again tarted up Farish product - but I want a wider range of locos for any future layout. I have had a N8 kit tucked away for many years and this has slowly emerged in recent months; you may have read about it on the VAG. This is now in the paintshop and without pausing for breath I have launched myself into a recently acquired D49 kit as commissioned by Edward Sissling and produced by Bob Jones. 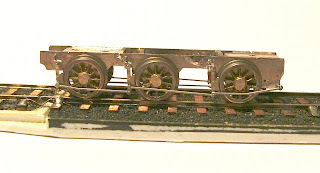 Now this is the first time I've built a bespoke 2mm loco kit. The N8 etches are really only a scratchbuilding aid. Whilst I utilised Bob's J27 chassis as the basis of the N8 running gear, there was still much trail and error in the erecting of this loco. I had to devise my own motor mount, fabricated a rear pony truck and work out how the chassis would fit onto and within the loco body. So I am hoping that building the D49, whilst challenging, will be more straightforward and ultimately a speedier process. Having built some of Bob's rolling stock kits, including some rather nifty little 13T hoppers, I know that his design work is unrivalled in 2mm and probably in 4mm scale too. Here are a couple of views of the tender chassis. The brake rodding is very impressive, but quite straightforward to fabricate. You can just see the "springing" set-up on the inside of the frames as devised by Mick Simpson. The instructions mention this system, but don't explain how to make it! Luckily I've used it before and was familiar with how to fit it in. Welcome to the NEAG Blog, Tony. I've not seen another D49 under construction so far, so yours could be the first to get finished ! Look forward to following your progress on it. Just had a chance to catch up with the blog and what you have put on is exactly what I'm wanting to see 'blogged'. I too will follow the progress and be looking for articles for the Magazine as well.